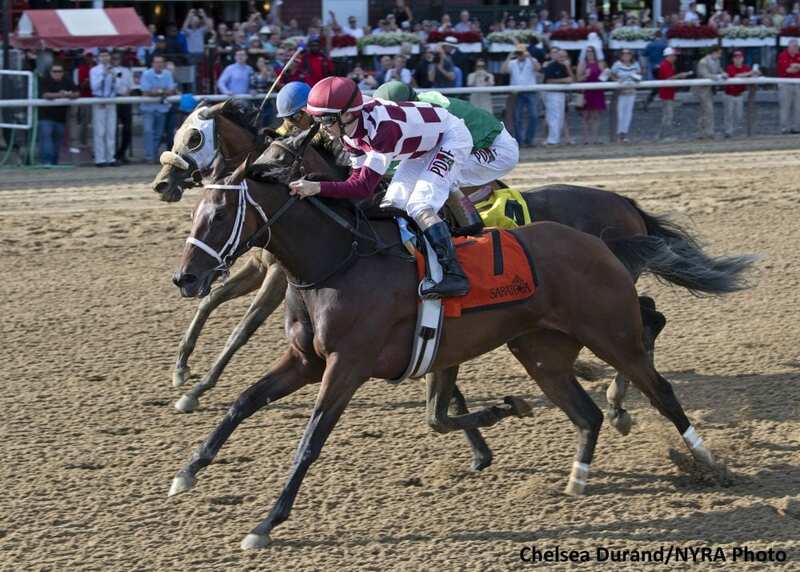 Coffee Pot Stable's homebred Farrell picked up her first victory since January with a wire-to-wire score in the Grade 3, $200,000 Shuvee for fillies and mares at 1 1/8 miles on Sunday at Saratoga Race Course. Farrell, with regular jockey Channing Hill aboard, broke from the outside post in the field of seven and quickly established control. The 4-year-old Malibu Moon filly led through an opening quarter mile in 24.35 seconds and a half in 48.31 with Chilean Triple Crown winner Wow Cat sitting just off the pace in her North American debut. Wow Cat moved closer in the final turn, locking up with Grade 1 Ogden Phipps runner-up Ivy Bell at the top of the stretch. The pair seem poised to get by the pacesetter, but Farrell soon reengaged down the lane, digging in through the final sixteenth to hold on by a neck over Wow Cat. Farrell completed the two-turn route in 1:49.35. Sent off at 9-1, the Wayne Catalano trainee returned $20.20 for a $2 win wager. Verve's Tale, with a late run in the middle of the track, secured third, crossing the wire a head behind Wow Cat. Ivy Bell was fourth. Pacific Wind and Tiger Moth completed the order of finish. Frost Wise was a late scratch. The win pushed Farrell's lifetime earnings past the seven-figure mark, bringing her total to $1,064,777 with a record of 8-2-2 from 17 starts. The Shuvee was her first victory since taking Oaklawn Park's listed Pippin in January. A four-time Grade 2 winner, Farrell entered Sunday's race with two runner-up finishes this spring at Churchill Downs in the Grade 1 La Troienne and the Grade 2 Fleur De Lis. Most recently, Farrell was an early scratch from the July 14 Grade 2 Delaware Handicap. Catalano added that Farrell will likely be under consideration for the Grade 1, $500,000 Ketel One Ballerina at seven furlongs on August 25, a Breeders' Cup “Win and You're In” qualifier for the Filly & Mare Sprint. This entry was posted in NL List, Racing and tagged channing hill, coffee pot stable, farrell, malibu moon, saratoga, Saratoga Race Course, shuvee stakes, Wayne Catalano, wow cat by NYRA Press Office. Bookmark the permalink.